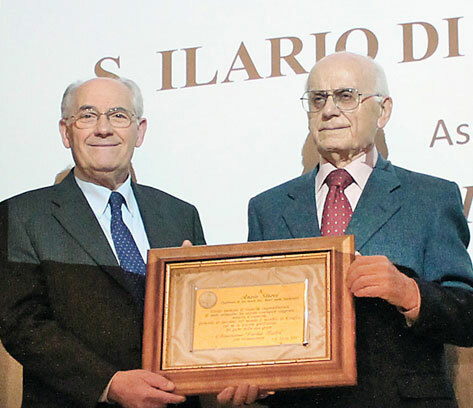 The winner of the twentieth edition of the Parma Nostra Sant’Ilario Award is our President Anzio Storci (in the picture with Mr Renzo Oddi), who was presented with the coveted prize during an event held in Storci on 18 January and attended by the Mayor of Collecchio and the Chairman of the Young Industrialists’ Association. During the engaging, at times even emotional event, Parma Nostra President Renzo Oddi presented the award to Anzio Storci, after Storci himself and a number of former Barilla and Parmasei colleagues took a look back down the road that led to our President’s current success, recalling amusing, significant episodes from the working life they have shared. Explaining why his Association (which since 1994 has been presenting awards to especially deserving citizens who have made an important contribution to the city) chose Anzio Storci as this year’s winner, Renzo Oddi said: “We opted for Anzio Storci as a result of his impressive business expertise; it is these skills that prompted him to found a company like his, which has always remained on the crest of the wave, becoming a market leader in the sector that deals in technology for the world of pasta”. When asked “What is the secret behind such a successful career?” Anzio Storci replied: “My secret is that I earned much of my early personal and professional expertise at Barilla, which I consider the finest company in the area where I live; this allowed me to move on to Parmasei and from there to Storci, my finest achievement, created alongside my children, who, like me, were keen to invest in the world of pasta”. The award ceremony and the reception that followed were also attended by Storci staff, who are immensely proud of their President’s success.